This painting represents my very first oil painting in my career. Inspired by an idea to create a mural of paintings on my office wall to add some cheerfulness to the ambiance, I set out to collect a series of photographs to paint. Central to this mural was a photo of my friend Naoko. 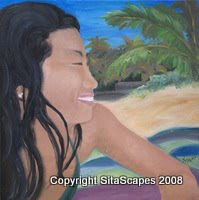 Her impetuous smile and contagious cheer made it a likely choice to focus my painting on.